One of the great things about music is the people you meet - these kind words are from people who have influenced me with their generosity, musicianship and joi de vivre. Emeritus Professor David Tunley has said of Jane's compositions "You have a decided gift for composing for the guitar ... what also impressed me was your feeling for musical shape - the pieces had a sense of direction and reaching for a point of climax .... They are very evocative... and your range of moods was fascinating." Paul Svoboda - I've also listened to your CD, and congratulations on a fine set of music. You play very well (under pressure!) and the younger players all did a great job – you must be very proud of your achievements with them. Rory O'Donoghue - Enjoying your CD and your compositions. Good to hear the students performing. Dr Jonathan Paget - It was a true delight to hear a concert of new works for guitar performed at the Kalamunda Performing Arts Centre last Sunday afternoon. Leading local guitarist and teacher Jane Darcey demonstrated her considerable talents as a composer in a plethora of new works for solo guitar, and guitar ensemble, which were warmly and enthusiastically received by a packed house. These include several soulful pieces for guitar and cello, performed by Jane and her son Beren Scott—a talented cellist studying at the WA Academy of Performing Arts. A myriad of solo guitar works were performed by Jane, many inspired by Australian landscapes—including one about Bluff Knoll, which featured quotations of bird song. Also notable was the musical depiction of a bushfire. Several pieces were expressly written for school-age guitar ensembles, performed by many of Jane’s talented students from Helena College and elsewhere. Undoubtedly, these works will get much use. 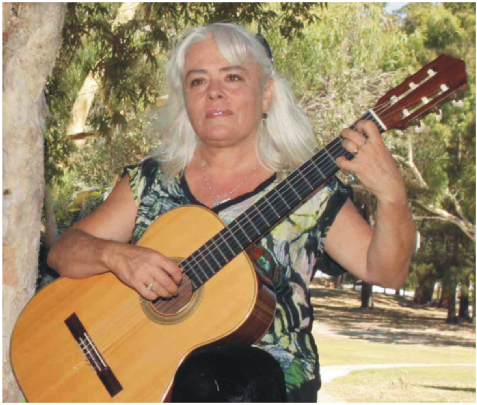 It is reassuring to see such composing talent coming from Western Australia; Jane’s compositions make a very valuable contribution to the thriving Australian guitar scene.